Mercury Jets provides on-demand private charter service from New York to Los Angeles. This transcontinental route is one of the most widely used by business executives, entertainers, and families who choose sunny Southern California to vacation. 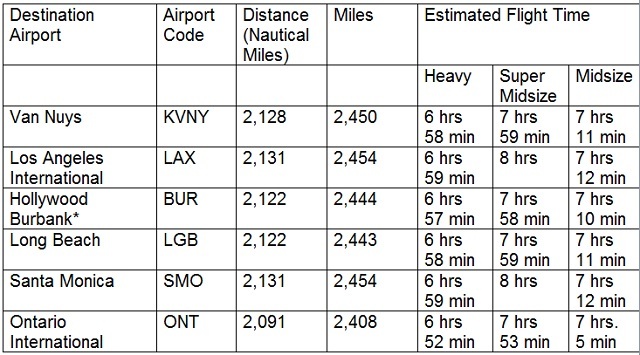 Several airports service private air charter flights from New York (TEB, HPN, JFK, EWR, LGA) to Los Angeles. 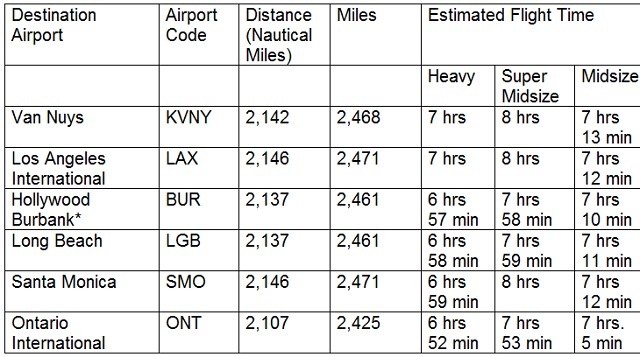 Hands down, Van Nuys (KVNY) is the most popular airport choice for private charter flights. 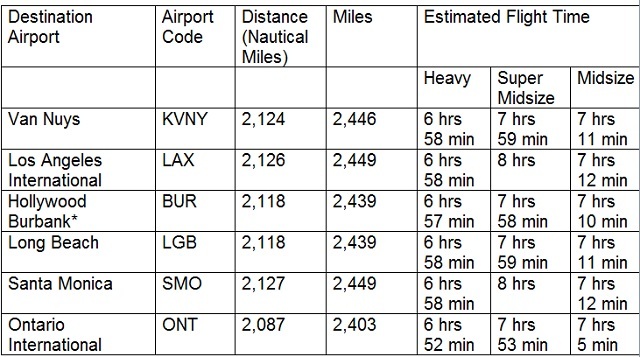 Other airports that serve this route include Los Angeles International (LAX) on the west side of Los Angeles, Hollywood Burbank Airport (BUR), closest to Hollywood and downtown Los Angeles, Long Beach Airport (LGB), John Wayne Airport (SNA), Santa Monica Municipal Airport (SMO), and LA/Ontario International Airport (ONT) in San Bernardino County, only 38 miles from the city. 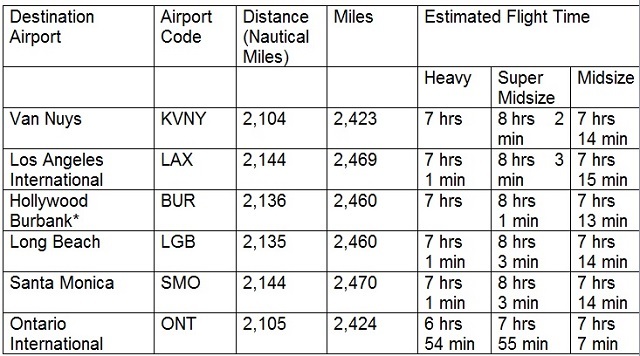 Distances and flight times shown in the charts above should be considered as estimates only. *A single One (1) nautical mile is equal to 1.1508 statute miles. Hollywood Burbank Airport is also known as Bob Hope Airport. Private air charters from New York to Los Angeles are serviced by heavy, super midsize or midsize jets. Heavy jets, such as the Dassault Falcon 2000, Falcon 7X, and the Gulfstream GIV, offer ample seating and spacious configurations for larger group flights, accommodating up to a maximum of sixteen people. This class of jets combines long-range capabilities with a wide body cabin space, high altitude, speed and comfort. Heavy jets typically feature a full galley and flight attendant service. 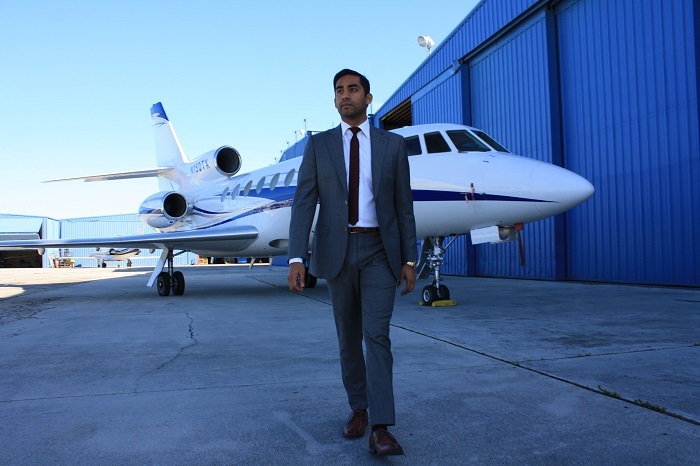 Super midsize jets, such as the Cessna Citation Sovereign, Bombardier Challenger 350 and the Dassault Falcon 50, offer passengers with all the amenities of midsize aircraft for a comfortable transcontinental flight. Super midsize jets can accommodate up to 9 passengers and typically feature a full galley and flight attendant service. Midsize aircraft options for private air charter from New York to Los Angeles include the Hawker 800XP and Learjet 60XR. Midsize jets can transport a maximum of eight passengers in comfort with performance and economy. Amenities include Wi-Fi, digital entertainment, catering and flight attendant service.